There are several styles by different amounts of blade shortening. The blade shortening work or the shortened blade is called "Suriage". Examples of original tang, by hand drawing. The tang keeps original, but the machi's are moved upward. It is done to shorten the blade length a little. So the tang length is extended. Such a small shortening is not called Suriage. It is just a "Machi-okuri". The reverse surface of the tang is ground with file sometimes to get a proper taper of thickness. The blade is shortened, but a part of the original tang is kept on one side. The machi's are moved upward, the bottom of the tang is cut off, the back side and cutting edge side is filed, to shape new tang. The obverse surface of the tang isn't touched to respect the original, even if originally unsigned. The reverse surface is ground off to get a proper taper of thickness. Therefore, in the case of the tang that has grooves running on it, the groove on the reverse becomes shorter by the grinding work. The new tang occurs a small bend by one side grinding, so it is straighten again. There is one more reason why the tang is ground such way, that comes from steel construction. Usually the core is milder than the outer surface in the meaning of tempered steel. So one side grinding means to keep the tang harder too. Sometimes, the original tang is left a few inches at the bottom of new tang, and signature of the smith is there. On the work of blade shortening, the hamon area is too hard to grind it off with file. So some part of hamon is heated to make it mild. Sometimes the hamon is vanishing by the heat. In the suriage work, there is a rule of filing mark and tang end shape. The new file work must be done right angle and cut the end straight, regardless of the original file mark or original end shape. 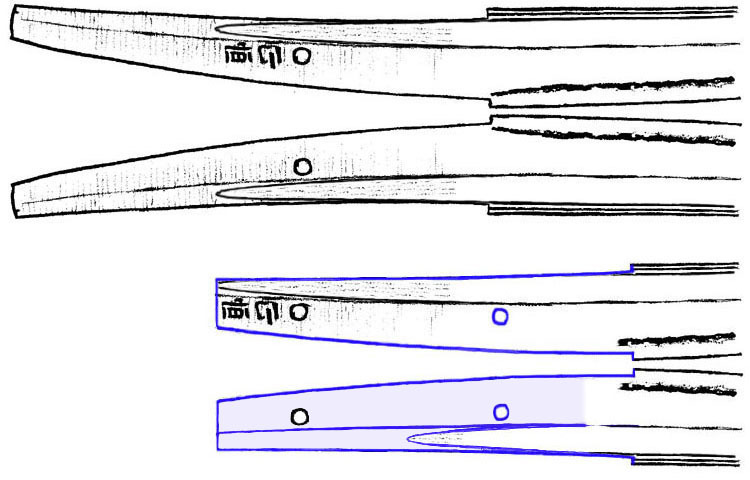 This rule makes it easy to find re-shaped tang and distinguish the original part left in it. But it is not an exact rule before 16th century. On the obverse, the lower part where has a signature is original. The upper part is newly filed. The reverse is all new filing. The hole is newly drilled. The small arc at the end of the tang is a trace of original hole. So much shortened as most of the original tang cut off, and fully re-shaped. The work is the same to that of Suriage. In this case also, one side should be kept its skin steel. Another way of O-suriage. Sometimes the tang is ground on both sides. Usually the word "O-suriage" is used for the tang that doesn't have any original part on it, but it doesn't always mean much shortened. If the blade is not so much shortened and all the surfaces are re-filed removing inscriptions, it can be easily called O-suriage. But, it is not O-suriage in its exact meaning. It is just a short suriage, though the signature is not left on it. Sometimes we find a smith's name on the tang of O-suriage blades. Some are put with gold inlay, and some are put with gold lacquer. Generally a gold inlay of a smith's name has to be done at the same time of shortening the blade, being sorry the signature disappear. Old Hon'nami put their attributed name with gold inlay on the shortened tang. Usually an attributed name has to be done with lacquer. A gold lacquer is used on the shortened tang (O-suriage). A red lacquer is used on the original unsigned tang. There are several ways to keep the signature in O-suriage blades. The signature is folded back to the other side of the tang. The newly filed surface of the tang has a channel to put the folded signature in good fit. This system is used to also suriage blade with long signature. In such case, lower part of the signature is folded back to the other side. Some examples of Orikaeshi-Mei in Suriage blades. The signature is cut off, and shaped as a thin plate. Then it is inlaid into the new tang. The signature is cut off, and patched at the bottom of the new tang with small rivets. 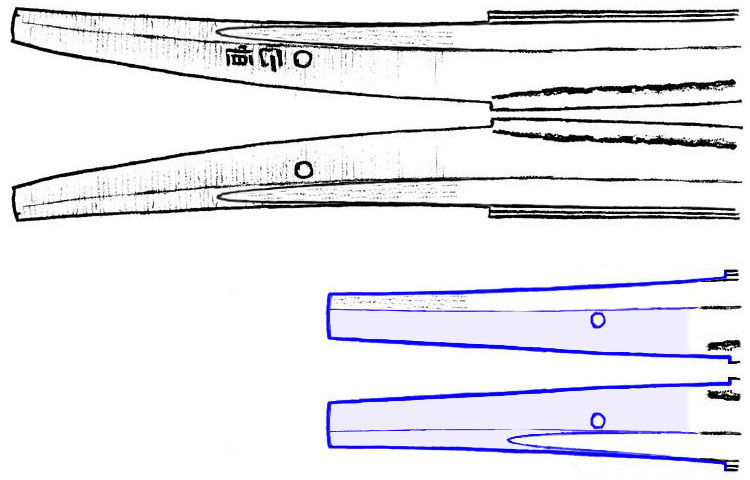 This system is used for broken blade that the kissaki is broken off. The tang keeps original, but the blade has no kissaki. Then the tip is sharpened by grinding from the back. When the blade is short as tanto, the tang is cut off to make good balance.